Ever since discovering the incredible king oyster mushroom and its unique applications in vegan cooking, I knew I had to try creating a recipe with them. I wanted to showcase their meaty texture, so I kept it simple, serving them in a lemon butter sauce over creamy vegan polenta. A drizzle of sun-dried tomato purée adds tang without overpowering the dish. This dish is perfect for a date night if you’re trying to impress a special someone, and I even filmed a recipe video on YouTube, where I make this as a Valentine’s Dinner! Vegan butter and nutritional yeast make the polenta ultra creamy, dreamy, and a little cheesy. King oyster mushrooms yield vegan scallops reminiscent of sea scallops while smaller trumpet mushrooms give a result more similar to the smaller “bay scallops.” Both will work fine as long as the stem is thick enough! The lemon butter sauce dresses the vegan polenta nicely and also complements a bed of sautéed spinach. I hope you guys love this recipe! Don’t forget to comment below if you try it and tag your recreations on Instagram @zenanzaatar #zenanzaatar, or pin it for later! 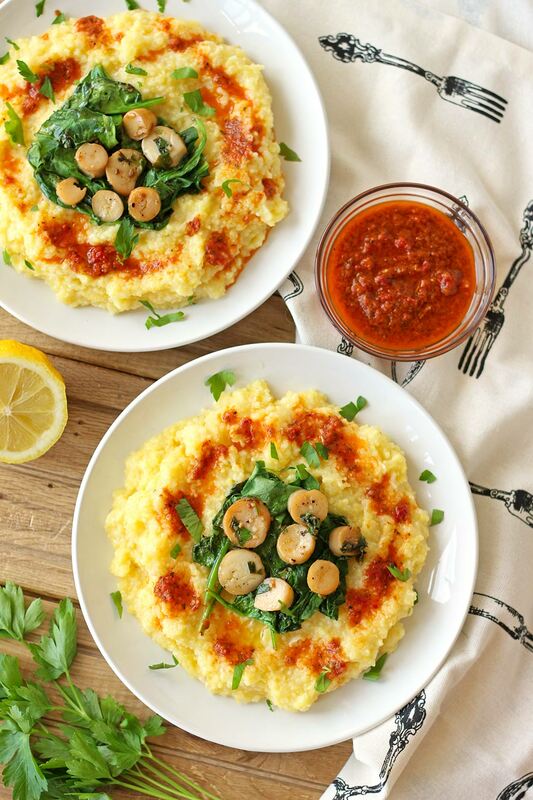 Seared oyster mushroom "scallops" in a lemon butter sauce, served over a bed of creamy vegan polenta. A sun-dried tomato purée adds color and tang to this dish. Cut the stems of the oyster mushrooms into about ½ inch thick medallions, depending on the size of your mushroom. Place in a bowl and cover with salted hot water and about 2 tbsp of lemon juice. While the stems soak, prepare your polenta. Bring the 4 cups of water and salt to a boil in a large pot. 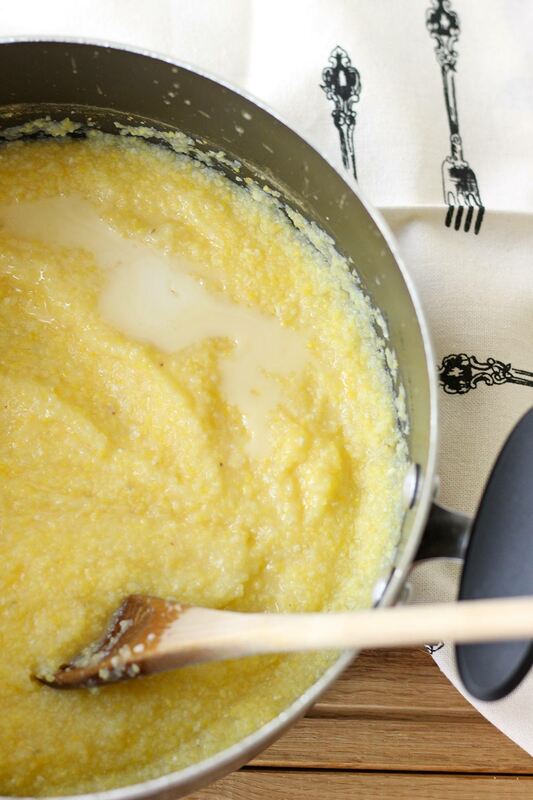 Once boiling, slowly add in your polenta in a steady stream while whisking constantly. Reduce heat to low and continue to whisk for a few minutes, until it is fully incorporated and begins to thicken. Cover until cooked, 15-20 minutes, checking every few minutes to stir. 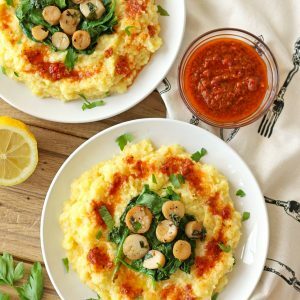 When the polenta's texture is smooth, creamy, and thickened to your liking, stir in nutritional yeast and remove it from heat. Add in the chilled vegan butter. Stir until about half the butter is melted, then cover and set aside. For the sun-dried tomato purée, simply blend the ingredients in a small blender, and if desired, add in more water until the desired consistency is reached. Prepare the vegan scallops. Heat olive oil and butter in a pan over medium high heat. Drain the mushroom stems and add them to the pan along with garlic. Sauté stems for about 3 minutes on each side, until browned. Season with salt and pepper. 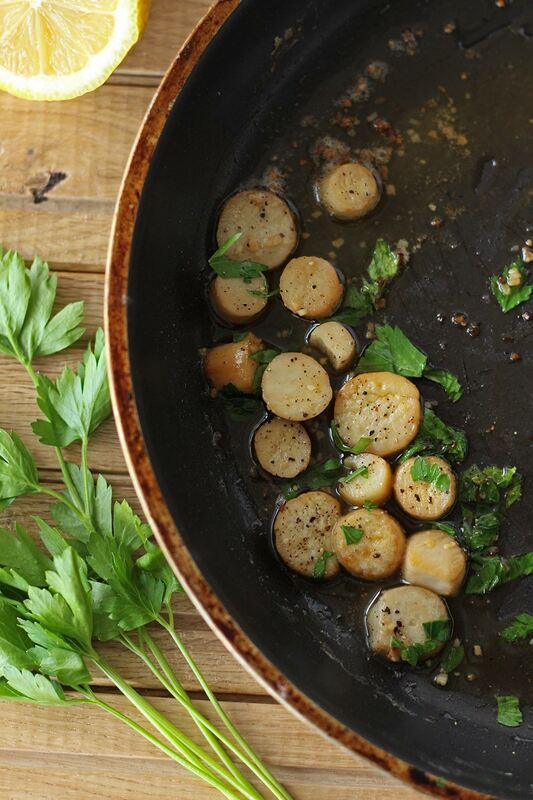 Once browned, remove the stems from heat and add the juice of half a lemon and parsley. Assemble and serve! 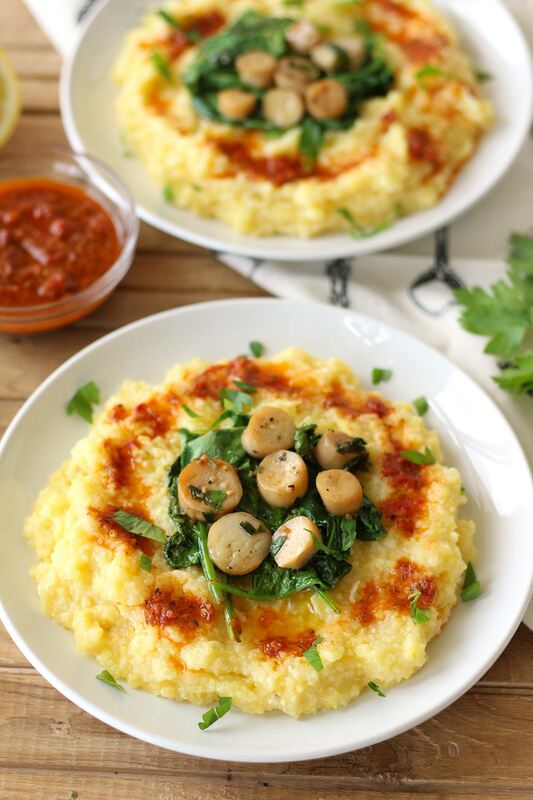 Place the scallops along with their sauce atop a bed of creamy polenta, and drizzle with sundried tomato purée. You can also serve it with wilted spinach (details in notes). ** Enjoy! *Make sure the mushrooms have large, thick enough stems to cut into scallop-like rounds. **For optional wilted spinach: Sauté a few cups of spinach in 1-2 tbsp olive oil until wilted; you can accelerate this process by covering the pan. After a few minutes, remove from heat and season with salt and pepper.